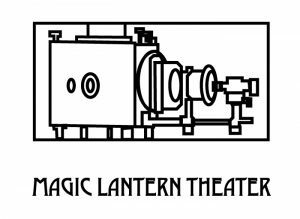 We are happy to announce another great summer season of second Saturday Classic Movie Nights screened by Magic Lantern Theater, Winchester’s classic film experts since 2001. 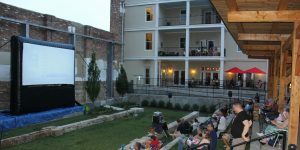 Moviegoers are encouraged to bring seat cushions, blankets or chairs and bring a picnic or take-out dinner from one of the many restaurants in Old Town Winchester. This is the perfect event to cuddle up with someone special and enjoy an old-fashioned dinner and movie night. With its starring duo of Paul Newman and Robert Redford, its jaunty screenplay and Burt Bacharach score, and its direction by George Roy Hill, this anti-hero Western “has gone down as among the defining moments in late-’60s American cinema.” (Rotten Tomatoes). Rated PG, 110 m.
Sunset Boulevard (1950) – Billy Wilder wrote and directed this indelible B&W portrait of Hollywood’s dark side, starring William Holden and Gloria Swanson. Rated G, 110 m.
Strangers on a Train (1951) – A chance encounter, a proposed “exchange of murders” and, eventually, a nighttime chase through an amusement park mark another of Alfred Hitchcock’s B&W masterpieces of suspense. Rated PG, 101 m.
The African Queen (1951) – Humphrey Bogart and Katherine Hepburn played off-type in this drama, alternatively suspenseful and comedic, of a mismatched pair floating on a tramp steamer down an African river and towards confrontation with a WWI German warship. Rated PG, 106 m.
It’s California in the 50s — Danny (John Travolta) is leader of the black leather jacket-wearing T-Birds while Australian Sandy (Olivia Newton-John) hangs with the Pink Ladies, a group of pink-wearing girls. It amounts to a joyful satire on 50s’ teen culture, punctuated by memorable song-and-dance numbers. Rated PG, 110 m.
RAIN LOCATIONS: To be determined.